The “leaks” and subsequent preorder sales by the huge online stores is really starting to disgust me, and I am generally 100% pro business. In essence, it’s allowing many of these stores to individually price fix, as the anxious, panic prone nerds make like lemmings to buy as the original offerings sell out, knowing subsequent offerings will be at a significantly higher price while also knowing that the price will likely crater a couple weeks after release, but falling prey to the “gotta have it now” convenience attitude that is prevalent these days. 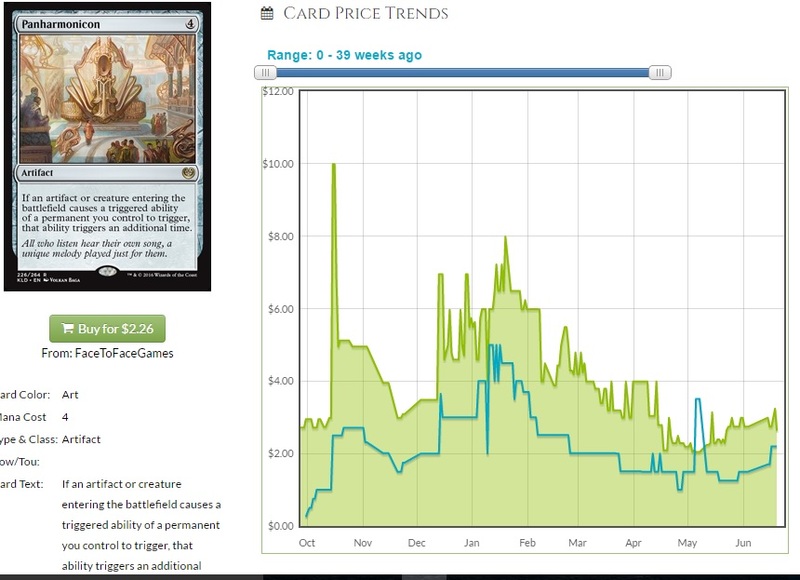 And all the while, we get massive complaints about how the game, especially eternal formats, is too expensive. It’s obvious that Wizards recognizes this . I find it hard to believe that they don’t recognize how these preselling stores are hurting the player base. How long will it be before we start seeing massive numbers of complaints about standard being too expensive(we already get plenty) as players dump money into over priced presales, in some cases two and three times over the real value, thus losing even more money than they would have before presales became a thing. Not to mention having their money split between the constant offerings of new product, but that’s another issue. And how many sales does this take away from the smaller LGS that can’t afford to open 50 cases of boosters to guarantee preorder sales? You can’t keep the doors open on 5$ FNM and 20$ draft nights alone. Obviously nothing can be done about the presales from a legal standpoint, but we don’t have presales without the “leaks” and spoilers. Leaks are one thing, they are usually a couple cards, and it’s rather hard to keep a single individual from engaging in leaking. As well, there is nothing wrong with spoiling a couple cards, or even mechanics. That’s fun, and drives hype in a respectable way. The last point was subjective, I know. I think though that most of us do enjoy a couple of spoilers. Spoiling an entire set, thus wildly inflating the value of the set, is on a different level, to the point where the idea of value becomes less about what you are getting for your money, and more about how we can mitigate our loses on the cards we need to play. That change in attitude on the part of the buyer isn’t going to lead to anything constructive for anyone other than the Star City Games of the world, and Hasbro, who can now guarantee a number of sales out of the gate. It does make me wonder how sincere the player base is about their complaints about the game being to expensive, as they continue to do their part to drive presale prices, thus doing their part in making the game much more expensive. Are they really that ignorant? Or are they just so caught up in the feeding frenzy that presales have become? You’re bringing up a number of points, and I think I’m going to bring up an old standby here: Wizards makes money from sales of new product. 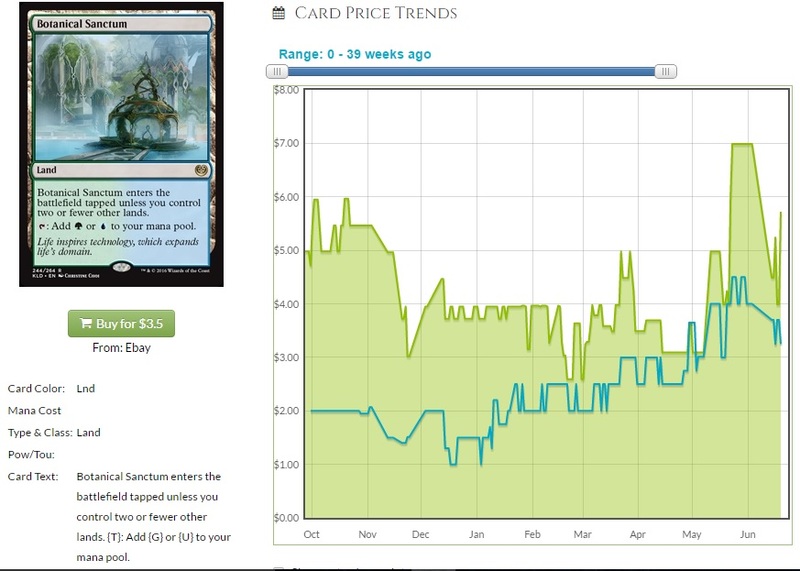 Older formats, while they can cause people to come out for a GP or something, don’t make Wizards any money directly. 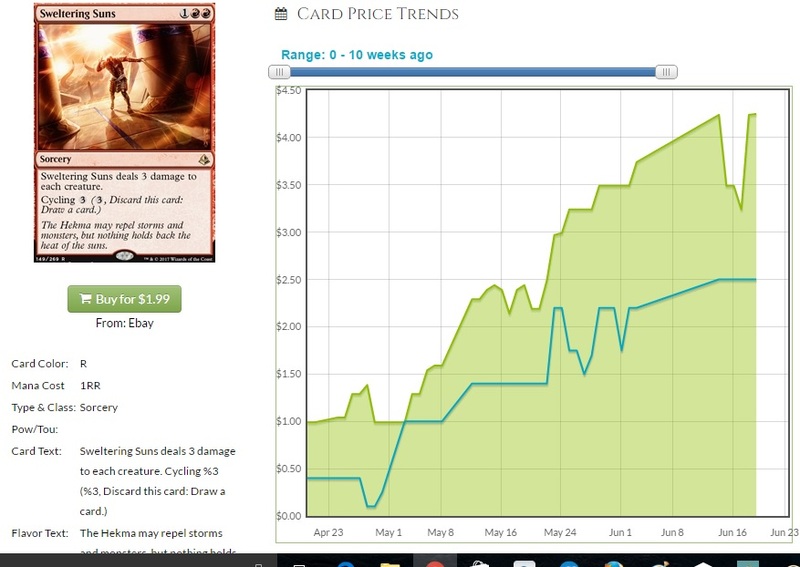 Presales are good for Wizards, and they are a way of measuring the community’s excitement. Solemnity has caused a bunch of things to spike and it’s not done. So many thing use counters! All of Hour was not revealed yet, correct? Was this article published a week early? How did Cliff come by that idea? That’s my bad. I mixed up exactly when it’ll be revealed. I’m a week early. I’ll go fix that. A whole slew of cards couldn’t be played because of Marvel and Ulamog. 3 Drop Gideon was useless vs that deck. 95% of the format was useless, that’s why it was banned. A popular deck now is Temur Energy substituting in Glorybringer and Chandra Torch in place of Marvel and Ulamog. Unfortunately for Amokhet as a set the cards have better synergy with other/older formats. It’s an extremely underpowered set, and Hour of Devastation looks even worse except for the ultimate hate enchantment which looks super fun to play against #Sarcasm. How long until Ballista owners and players on Energy decks complain about banning Solemnity out of Standard? I’ll give you a 100:1 on that happening within 1 week if it hasn’t started. 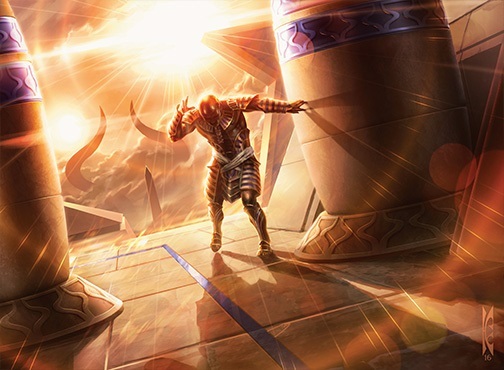 Ballista+Snake+Rishkar+V Hulk vs Temur Energy vs. Mardu Vehicles vs. Combo deck X; this is a solid guess at what Standard will look like at the SCG invitational this week. I know you published your article several days ago, but you really have to do a better job with your articles, especially with no one writing on the site any more. Take a page from Jason Alt and learn one format extremely well and write the sh*t out of how to exploit it. If you are stuck writing about Standard I am sorry, because other than a few specs that get missed there isn’t going to be a lot of money opportunities for a while. And Glorybringer is likely a huge benefactor of the banning…plus Stormbreath and Thundermaw DID HAVE HUGE SPIKES AND PRICE TAGS, so I don’t know what the F’ u r talking about. Do You?!?!? !